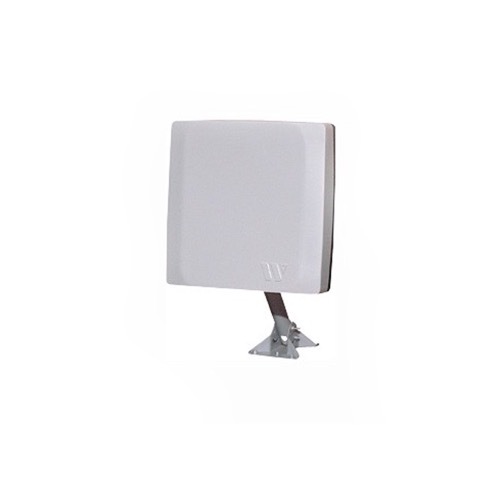 The SquareShooter HDTV directional antenna by Winegard is designed for high definition (high resolution) digital TV. HDTV (High Definition TV) has 10 times more picture detail than analog signals! And the SquareShooter HDTV receives these HDTV signals at greater distances! For example the Analog range is 45 miles; Digital range is 50 miles. With HDTV, advantages include more detailed pictures, high quality sound, plus theres no snow or weak signal area with this technology. You receive a perfect picture on your TV, or no picture at all. Because of its size and versatile installation options, it can be mounted practically anywhere for the best DTV / HDTV reception such as on walls, fascias, roofs, patios, attics, or railings. The SquareShooter HDTV has exceptional reception characteristics for UHF channels 14-69. Integrated 12 dB gain amplifier across both UHF VHF bands for better reception of digital HDTV channels. Includes hardware to standard Dish Network / DIRECTV dish antenna masts. Includes J-Type mast and mount.